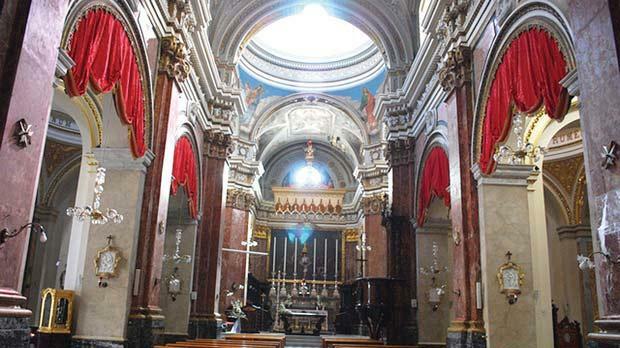 The reconstructed church of St Lawrence in Vittoriosa where Stefano Buonaccorsi and Isabella, Grand Master de Valette’secret daughter, were married. 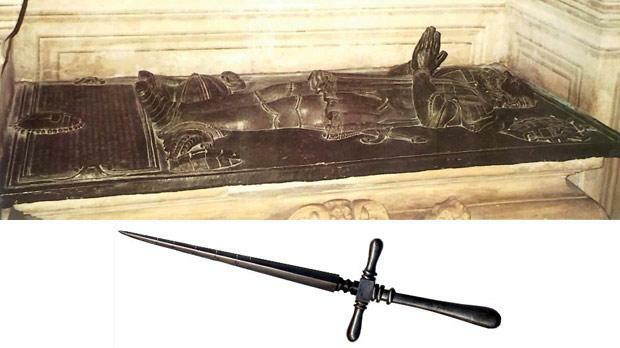 Bronze coverlet on Grand Master de Valette’s sarcophagus in the crypt of St John’s Co-Cathedral and a stiletto, very likely the weapon Stefano Buonaccorsi used to murder the Grand Master’s daughter on July 31, 1568. Jean de Valette passed away heartbroken only five months after the King of France legitimated one of his natural descendants, Barthélemy, son of the Grecque woman. The Grand Master died after his secret daughter had been murdered by a distraught husband in a horrid crime passionnel. This story sounds like something out of an implausible Gothic novel or the plot for a tired Hollywod movie. It is not. All the indications point to Isabella Guasconi, the victim of a damaged love turned to vicious fury, having been the Grand Master’s daughter – that is what the historian Giacomo Bosio obviously wants his readers to decipher, being quite prudent not to spell it out in so many words. De Valette had stood as Guasconi’s godfather at her baptism, just after she was born; he had felt the duty to “arrange” her marriage, bound to do so by a very private reason, and had then collapsed in frenzied grief at the news of her death – in fact, he too died shortly later as a direct result of the “immense distress” the homicide had seared on his spirit. The historian emphasises each of these circumstances, and leaves the obvious conclusions to the intelligent reader. For the Knights of Malta, standing as godfather at the baptism of their illegitimate offspring was the accepted alternative to a formal acknowledgement of paternity, strictly forbidden by their own statutes. This ‘godfather’ abuse had become so widespread that the Council felt the need to legislate against it, and formally forbade knights to hold any children in baptism, except those born to the nobility – a ban that most who disregarded the vow of chastity, disregarded. The old statutes saw through these phony ‘godfathers’ – very much fathers and very little God. De Valette stood at the side of Guasconi on her wedding day – it was as if he was “giving her away’”. In fact, the historian underlines the fact that de Valette had taken upon himself the marriage arrangements “obliged to do so for his own private reasons”. Formally, the record refers to Guasconi as the daughter of a Rhodiot nobleman of Florentine descent and of his wife, but that appears to be a thin pretence convenient to keep up appearances. Putting it otherwise would have set the morality vigilantes snarling at de Valette’s heels. In reality, Guasconi was the daughter of de Valette, and of the nobleman’s wife. The papers describe the girl as young and exceptionally beautiful. No surprises there: she came into the world wired to a privileged genetic pool. We do not know what her mother looked like, but those who met de Valette remarked how well built, toweringly tall and imposingly handsome he was, even in his older days – no wonder the ladies fell for him. In theory, the statutes of the Order of St John came down heavily against any breach of the vow of chastity. To pre-empt temptation, the Council introduced a rule that no knight could have any woman in his home – and that included servants and slaves – below the age of 50. If menopause did not ensure chastity, at least it ensured its breach would not leave telltale evidence. In a Grand Master’s case, the monarch and the menarche. Birth control, though not unknown, then still hovered on the rather messy, impractical side. And the other rules which the Order codified against concubinage appeared, at least on paper, quite ferocious. Grand Master Antoine Fluvian (1421-1437) was probably the first to place on the statute book specific norms to regulate the vow of chastity: “It shall not be lawful for our brothers to keep or maintain in their home, or elsewhere, any mistress, or to be intimate with her. And if anyone, having thrust his honour and good fame behind him, should dare to act otherwise, and being publicly indicted, either on trustworthy evidence or through his own confession, be convicted of such a sin” then a number of consequences followed. If after 40 days and three warnings by his superior, the knight had still not rejected his mistress, he ran headlong into a catalogue of penalties, ranging from demotion, to loss of income and seniority to the final infamy: expulsion from the Order. As if that were not enough, Grand Master Philippe de Villiers de l’Isle Adam reinforced the ban against knights having illegitimate children or acknowledging them. He reserved for those knights openly living in sin some rather hard, if inappropriate, names: incestuous, adulterous and sacrilegious. Should a knight have illegitimate children – something damnable even for those who were not knights, L’Isle Adam remarked – and should the father attempt to acknowledge them by giving his bâtard his own or his family’s surname, then the transgressor would be banned from any office or dignity in the Order. L’Isle Adam specified who he was aiming at: not only those knights whose concubinage became notorious through a court judgment or a public confession, or because the relationship was so flagrant it could not in any way be concealed, but also those knights who, being without shame of their fellow men, disdaining the fear of God and forgetful of their professed vows, kept and provided for any woman suspected or accused of lechery and living together, and having frequent intimacy with her. Evidently what the Order really resented was not so much the breach of the vow of chastity, as the publicity and scandal attached to it. In other words, it formally codified the doctrine of si non caste, caute, first preached in Reims by the saintly Adalbert of Hamburg-Bremen in 1049 – the canonisation of institutional hypocrisy. Not surprisingly, Guasconi’s mother, de Valette’s lover, is again a faceless non-person, like most wives, mothers and daughters in the architectures of the history of power. In Barthélemy’s case we know at least that she was called Catherine Grecque. With Guasconi, the mother’s name proves to be totally expendable. In a religious-military Order, women were almost irrelevant by nature anyway, and Bosio had no interest in celebrating the adulteress who had turned the future hero of the Order from bad to bed. De Valette, triumphant over Mars but vanquished by Venus? That would not do. The most Bosio could punish her with was damnatio memoriae. And he did just that – wrap her up in impenetrable silence. There was little or no space in the solemn annals of the Order for the bunga bunga of the anointed ones. I do not want to read too much into the narrative, but even the family surname of the girl Guasconi may be a coded signal. Guasconi means from Gascony, south-west France, one of the regions the de Valettes hailed from. A Florentine gentleman, Stefano Buonaccorsi, seems to have fallen in love with Guasconi, and asked for the hand of this prime damsel of dazzling beauty (and impressive dowry) in marriage. The Buonaccorsi represented a very notable Tuscan family who had over the centuries distinguished themselves in trade, banking, the Church and the arts – a previous Stefano Buonaccorsi had won great fame as a lawyer and jurist, and many of that surname professed in the Order of St John. Why Buonaccorsi was in Malta is unknown, and nothing indicates he came to the island to become a member of the Order or that he had stayed over from the gran soccorso of the Great Siege. But he left other traces in Malta. Shortly before the murder, on June 5, 1567, he engaged Notary Giacomo Baldacchino in Città Vittoriosa to draw up a general power of attorney in favour of his brother Giulio in Florence, to deal with a debt of 50 scudi he owed the prominent Florentine bankers Francesco Guidacci and Andrea Arrigucci. Then, five months later, on November 18, he went to a different notary, Giuseppe Deguevara, to sign another general power of attorney, again in favour of Giulio. A Giulio Buonaccorsi features as a member of the Florentine guild for adolescent children of higher-class families, The Boys of the Archangel Raphael, in a play based on the story of Tobias staged by the confraternity, together with his brothers Giovanni and Niccolò, all sons of Antonio Buonaccorsi. Giulio played the part of Habat, a cousin of Tobias, and Giovanni, that of Rosetta, a maid. This seems to indicate that our Stefano was the son of Antonio. We do know that Isabella’s marriage had been arranged by de Valette, who “gave her away” in the ceremony – very likely in the church of St Laurence in Vittoriosa. Girls in the cinquecento usually married young as a matter of routine. The fact that the chronicler felt he had to emphasise how young Guasconi was, seems to indicate that she may have just reached her very early teens on the day she wed. Fate decreed this to be anything but a happy marriage, and the path to dire tragedy soon stared the fresh newly-weds in the face. Maybe because the husband was inordinately insecure or jealous by nature or because Isabella had genuinely started cheating on him quite early on, Buonaccorsi became obsessed by his wife’s real or perceived infidelity. The chronicler puts it “that his wife’s chastity became suspect”. Inevitably the day came when the manic jealousy of Buonaccorsi got the better of him. His honour was at stake – no Florentine could take the C-word with composure – to a cinquecento Italian, that meant he did not see many choices open to him. 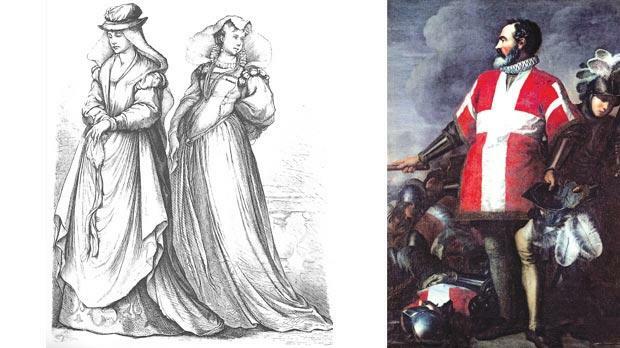 On the 31st day of July 1568, he waylaid the beautiful Isabella and murdered her. Had he set up his wife in a honey-trap and then discovered her in flagrante? If so, contemporary law knocked off most of the criminal responsibility normally attached to homicide. I am not so sure the same leniency applied to a wife who snuffed out her husband caught horizontal with his floozy. Rather doubt it – those were the good old days when laws were still enacted by men for men. Buonaccorsi grabbed all his wife’s monies, valuables and jewellery and went on the run. He and the loot literally disappeared. If his was a premeditated crime, he may already have planned his escape carefully before he took his wife’s life. Headline-grabbing news like the murder of the Grand Master’s love child must have shocked all Malta, not least the large colony of knights in the Vittoriosa area (the new city of Valletta was still almost uninhabited then). The tragic, violent death of his beloved daughter totally unhinged de Valette, Grand Master since 1557. In his frenzy to wreak his vendetta on his daughter’s assassin he mismanaged any command he may have previously exercised on good judgement. He did things he would never have thought of doing in his right senses. He convened an urgent, extraordinary meeting of his Council to put into effect a massive manhunt to apprehend the Buonaccorsi killer. All this was hugely misguided – the Council only had jurisdiction to regulate the affairs of the Order, not to grandstand the Grand Master’s personal griefs and grievances. The Council would properly have intervened had either the killer or his victim been a Knight of St John – then yes, that would have been its business. But neither Buonaccorsi nor Guasconi belonged to or had any connection with the Order, so calling that meeting looks today like what it really was: totally foolish and irregular, the by-product of ultimate bereavement, blinding panic and unclear thinking. The murder by a disturbed civilian of his civilian wife fell squarely within the jurisdiction of the ordinary lay criminal courts of Malta, not of the Council of the Order, and the latter should have had nothing to do with it. But then, a distracted father would not have seen that. No one in the Council challenged these obvious irregularities. They all bowed to the riveting authority of grief. De Valette set all the Order’s resources, its security services, its police force and its spies in a massive manhunt to apprehend Buonaccorsi and bring him to justice – read: to haul him before the father’s unquenchable thirst for vengeance, and always a savage one in the best of circumstances. But the combined efforts of all the Grand Master’s initiatives never, apparently, succeeded in finding the wife-killer. By the time the hunt was on, Buonaccorsi had already vanished into total nothingness – obviously he had absconded stealthily from Malta to lead a new existence under an assumed identity somewhere in Europe or elsewhere. But the Order had at its disposal well-tested, highly secretive ways of liquidating its enemies abroad or for kidnapping fugitive criminals outside Malta, to bring them back to justice before the Grand Master – those who fled the island without first settling with society the debts of their crimes were condemned to live all their lives in fear, looking over their shoulders. Buonaccorsi was never heard of again. In fact, there is no way to exclude that Buonaccorsi was apprehended and assassinated abroad by de Valette’s secret services – another nameless corpse found floating down a river or headless in a forest. An eminently clandestine operation like an extra-judicial execution carried out for private vendetta obviously leaves no trace in the records – if, of course, it occurred at all. The important valuables Buonaccorsi had stolen from the young victim of his homicidal wrath certainly came in handy to buy silence and survival – gold and diamonds have always had a persuasive ring to them – and the dowry and the precious adornments of a Grand Master’s love-daughter whom he doted on would certainly have been quite spectacular. In his flight from justice, the historian adds, the killer had been aided and abetted by knights from Florence, who erected an impregnable wall of omertà around Buonaccorsi to shield their murderous compatriot. They would have justified, probably praised, Buon-accorsi’s recourse to honour killing. This may also have been another way the disaffected young knights from Tuscany chose for settling scores with the by-now wholly paranoid, despotic tyrant de Valette. The cruel homicide of his adored Isabella precipitated the Grand Master’s death. He fell into a profound melancholy from which he never recovered, and the steep decline of his spirit and of his health proved irreversible. But de Valette had always distinguished himself by his fighting spirit. He did make a brave effort to push back his terminal anguish by immersing himself in his lifetime’s favourite sport: hunting with falcons for partridges in the area of St Paul’s Bay. That pastime did not work for him this time round, and nothing else did. An insurmountable grief scorned his very reason for living. No way could he come to terms with his monstrous inner tragedy. He marched resolutely towards twilight. He needed no help to cry. A stroke hurled him violently to the floor of the chapel during prayers, followed by an intractable fever. De Valette died, brokenhearted, less than a month after the murder. My warmest thanks to Andrea Costa for accepting to transcribe the legitimation document of Barthélemy de Valette, and to Joan Abela, Carmen Depasquale, Michel Fichant and Anna Sceberras Trigona, for their invaluable assistance throughout.